Deity Mantra and Wisdom: Development Stage Meditation in Tibetan Buddhist Tantra, by Jigme Lingpa, Patrul Rinpoche,and Getse Mahapandita Tsewang Chokdrub, translated by the Dharmachakra Translation Committee. 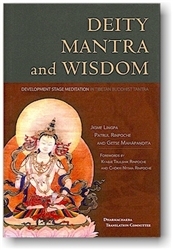 The development stage is one of the central practices of Buddhist Tantra. The texts contained in this volume are among the most widely studied commentaries on this topic and have formed the basis for spiritual study and practice for centuries. Jigme Lingpa (1730-1798) was one of the great saints of eighteenth century Tibet. His profound spiritual revelations and erudite writings have proven to be some of the most enduring classics of the Buddhist tradition. To this day, they continue to inspire others to lead a life of meditation. Patrul Rinpoche (1808-1887) lived his life as a wandering yogi devoted to the practice of meditation. An accomplished scholar and prolific writer, he has won the hearts of many with his rare ability to present profound philosophical thought in a manner directly applicable to personal practice. Getse Mahapandita Tsewang Chokdrub (1761-1829) revitalized the tradition of the Nyingma School through his commitment to the study and preservation of the Ancient Tantras and the revival of many Nyingma monasteries. Among his extensive literary works, his commentaries on the development stage have become central reading for numerous practitioners of Buddhist Tantra. The Dharmachakra Translation Committee draws its inspiration from the vision, commitment, and magnificent achievements of past Buddhist translators. Directed by Chökyi Nyima Rinpoche, the Committee is dedicated to making Buddhist classics available to modern readers in their native languages.